It is probably true to say that every book has one major theme running through it, and probably a few sub-themes. Writing the second edition of a book is a great opportunity to revisit its primary topic to see whether it is still relevant or not. I found it really interesting to revisit the book I wrote with Elaine over ten years ago – Information First – when we updated it this year for its second edition. 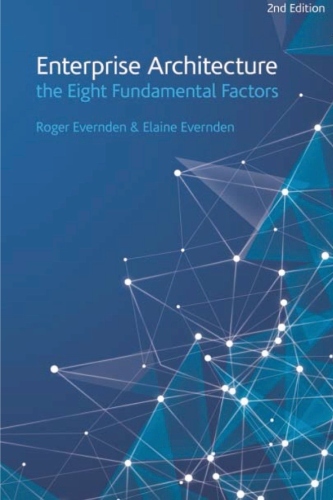 The new edition has a new title – Enterprise Architecture: the Eight Fundamental Factors – which reflects a subtle shift in emphasis.The eight factors were a central part of the first edition – and have been a recurring theme in my EA research and practice since the late 1980s! But for the first edition we emphasized the central argument that architects needed to focus on information needs before considering technology solutions, giving us the full title: Information First – Integrating Knowledge and Information Architecture for Business Advantage. So with the new edition, there is still an underlying sub-theme that we are in the information age, and that the use of information and managing by wire are still the root of what enterprise architecture is all about. But it is not the main theme of the new edition. The major theme is that EA is a multi-dimensional discipline, and that research into the many architecture frameworks and approaches reveals that there are eight fundamental factors that are the basis for any EA ontology. The eight factors represent the different dimensions of EA. In effect, the eight factors make up a meta-framework for EA. Why are they so important? Because they represent the fundamental factors that are the basis for all EA frameworks. So you will find these factors repeated in the Zachman Framework, in TOGAF, in DoDAF, PEAF, and any of the other frameworks that have been promoted over the years. It always used to concern me that there was a never-ending proliferation of EA frameworks – instead of a consensus of the basic, fundamental, atomic, primitive elements that could be used to create the tailored and customized frameworks that were actually needed for a particular EA task. When I first faced this problem it was because I was trying to adapt the Zachman Framework to fit an innovative enterprise architecture under development at Westpac bank in Australia. Try as I might I couldn’t align the Zachman Framework with the Westpac approach – I later realized it was because the Zachman Framework was based on a different paradigm; I ended up creating the Information FrameWork () to meet the Westpac needs. In re-writing the original book for its second edition I am convinced more than ever before that we do not need any more pre-defined EA frameworks. Instead we need a simple meta-framework, made up from a number of fundamental factors that together form an EA ontology. I genuinely see this as the way forward for EA, and to this end I see the eight factors very much as a starting point – a first step into the future. I gave each of the eight factors a label, and in the new version of the book I describe alternative labels. The label is not the important thing – but the notion behind each factor is critical, because it is the factors – individually and in combination – that are used to create the EA frameworks that make sense for each particular project. I’m not sure how long it will be before a third edition! But I am looking forward to the continued discussions and debates with enterprise architects over the coming years, and the feedback and input this will provide to improving this concept of a meta-framework and an ontology of fundamental factors.